"We are so pumped to come back to SA. The shows in 2014 were unreal, the fans were incredible," said Mike Porra, Nitro Circus Executive Chairman & Head of Creative. "Now to have an opportunity to come back with Travis Pastrana riding & with an all new show, this tour is going to be epic." "I'm so excited to finally have the chance ot go to SA & ride for our fans there," said Pastrana. "I was so disappointed that my broken leg sidelined me last time. I kept hearing how awesome the shows were & that the crowd energy was off the charts. It's where some of our all-time greatest moments happened & I can't wait to be there this summer!" An all-star international lineup with multiple X Games medalists & the best riders in action sports' biggest disciplines such as freestyle motocross, BMX, scooter & inline. Be prepared to see the daredevils ride a host of new contraptions (I have inside info, that we can be prepared to see things like tricycles & even a wheeled recliner.) off the famous Giganta Ramp. It is going to be fun for fans of all ages. 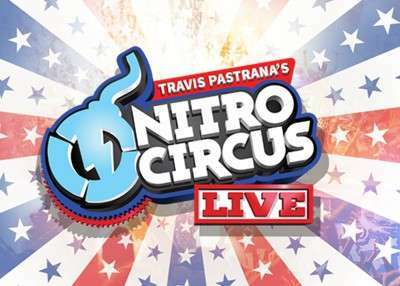 There are super cool Nitro Club VIP packages available too, that include the best seats in the house, a sneak peak at rider rehearsal & a chance to see the Nitro Circus athletes during a pre-show Q&A session. You will also get a souvenir lanyard & a signed Nitro Circus poster. 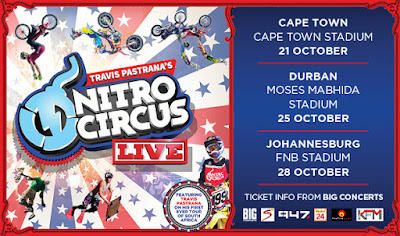 To top it all off, you also then stand a chance to win some serious cool Nitro Circus swag. For those of you, who don't remember. In Feb 2014, the late Erik Roner, made the most jaw-dropping entrance ever imaginable in Durban. Backflipping from the top of Moses Mabhida Stadium. Now that is seriously something that I rate anyone would be keen to see.